to be bushwhacked by a too-tall sports mogul in Cleveland. 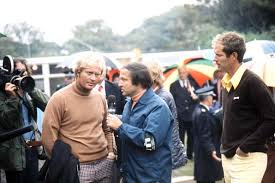 Jim McKay interviews Jack Nicklaus and tournament winner Tom Weiskopf at the British Open in Troon Scotland. Bill is on the far left, getting more great footage. In January or February of 1974 Gil Markle and I made a trip to Cleveland to do battle with Super-Agent Mark McCormack, who held in his hands the legality of our selling a film we had made to CBS Television. The summer before, we had travelled to Scotland to make a film about the British Open Golf Tournament. 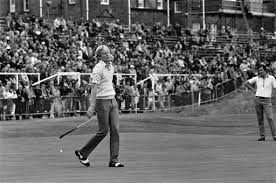 Actually, we were there to shoot some footage of Johnny Miller, a professional golfer who had gained celebrity by winning the U.S. Open earlier that year with a miraculous score of ‘63’ in the final round. Gil’s First Lieutenant Mike Forhan had scored a major coup by signing Miller to lend his name to what would become the Johnny Miller Golf Academy, which would operate under the umbrella of Gil’s travel company ALSG. Miller was young and blonde and handsome, and now he was famous – boding well for profitable possibilities for the Golf Academy. “Learn golf in Scotland where golf was born.” It seemed like a natural. 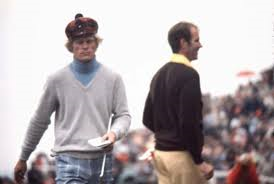 American teens flocking to Scotland to have their ‘swing planes’ and ‘short games’ corrected by the handsome and now-famous Johnny Miller. So we made the trip to Scotland to make a promotional film about Johnny Miller and his golf academy. And, other than Mike, none of us knew a thing about golf. 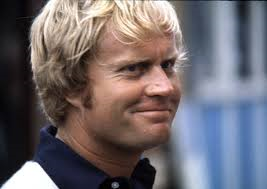 Johnny Miller had won the U.S. Open earlier in the year, scoring a miraculous 63 in the final round. My participation in this endeavor was purely accidental. 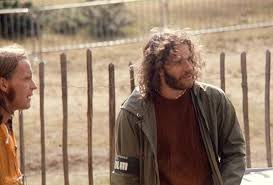 I was simply tagging along with Gil’s brother Bill, who was a close friend, and with whom I had worked on several film projects. Bill and his wife Viki, who had also become a close friend, were going to Scotland to make a film, and we thought it would be fun to include me. So, Bill, Viki and I, along with Gil, who I was meeting for the first time, boarded an ALSG-chartered stretched DC8 for the flight to London. The flight took forever. A re-fueling stop at Shannon went awry when the Aer Lingus ground crew broke the pressure seal on the cargo door. We waited five hours on the Shannon tarmac for the seal to be repaired. Next stop Stuttgart Germany. This was an ALSG charter, and we had two waves of eager and happy student travelers whose destination was the Fatherland. More problems with the plane in Stuttgart, with another five or six hours of down time. Finally, we took off for London’s Gatwick Airport, the main venue for chartered planes landing in the London area. This would lead to my first “How does Gil do that” moment. I did the Player interview, and he was everything Whitaker said he would be, and more. The long journey from JFK to Gatwick took over thirty hours, and we were dirty and exhausted. I don’t sleep on planes, and all I could think of was a shower and a welcoming bed. We remained onboard while the ALSG student travelers joyfully deplaned to begin their European adventure. Bill, Viki and I remained near our seats while Gil supervised the exiting kids at the rear of the plane. Bill and Viki looked as groggy as I felt, but Gil had changed gears and was in ‘executive-in-charge mode.’ Several of ALSG’s London personnel had boarded the plane, and Gil was involved in animated discussions, signing papers, accepting cash disbursements, and generally being the guy in charge. I was amazed. 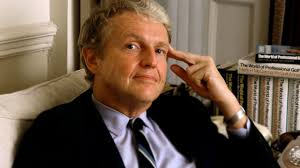 I remember thinking, ‘how can he do this?’ Gil was one of those rare people who, regardless of sleep deprivation, and in this case over thirty hours in a crowded, smelly DC8, could simply change gears and do what was necessary. This would not be the last time I would witness Gil’s exceptional behavior under duress. Three days in London. Gil had business to take care of in ALSG’s London Office, and the rest of us, ensconced at the Russell Square Hotel, did what Americans in London usually do. 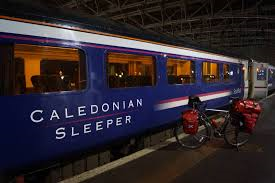 Then off to London’s Euston Station to catch the overnight “Caledonian Sleeper to Glasgow. Much story swapping and laughter on the train. I was getting to know Gil and enjoying him – his spontaneous laughter, and how he made intense eye contact when you spoke, listening to every word, and appreciating your input. An eventful journey north. We were met at Glasgow station by Mike Forhan, who had appropriated a minivan, and who drove us to Troon where the British Open was about to begin. Crafty Mike Forhan, through methods he never full disclosed, had befriended the female assistant to Keith MacKenzie, who ran the Royal and Ancient Golf Club of Scotland, and had hondled press credentials for all of us. God only know what he had told her. So we now had unlimited access to Troon’s ancient golf course, and to all of the players in the tournament. The British Open is one of the four “Majors” and all of the world’s famous golfers were on hand: Jack Nicklaus, Arnold Palmer, Gary Player, Johnny Miller, everybody – and the scene was visually magnificent, with tanned faces ready to be photographed with a background of stormy skies, and the wind-blown sea grasses of the Troon links. It was quite a site. 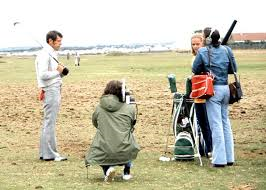 We quickly realized that the spectacle before us was much bigger that Johnny Miller and his golf academy. We had unrestricted access to a major sporting event. Johnny Miller on the fairway at Troon. With a fearlessness that comes from not having the slightest idea what we were doing, we proceeded to approach golfers for on-camera interviews, and to our surprise and delight, they were quite willing to participate. After all, those PRESS arm bands we wore, regardless if how surreptitiously obtained, spoke of our credentialed presence at this event. 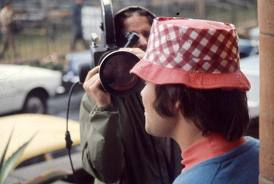 Bill, of course, did the camera work, with Gil, who was a novice at location sound recording, recording everything on Bill’s Nagra. Mike was operating behind the scenes, making arrangements, and targeting golfers for interviews. Gil had handed me his Nikon with a motor drive and 200 frame bulk loader, and I began taking stills of the event, and of our participation in it. 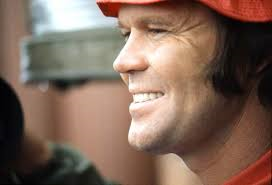 Glen Campbell during his hilarious interview with Gil Markle, who had trouble keeping his composure. 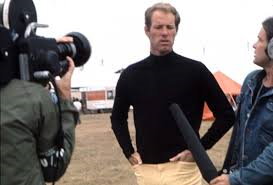 Gil did most of the interviews, most notably of singer Glen Campbell, who was an avid golf fan, and who gladly agreed to participate. Gil’s interview with Campbell was quite good until he began to lose it. I think the absurdity of the moment got to him. Here he was, in Troon Scotland, interviewing a major celebrity about golf, something he knew nothing about. And Campbell, not the brightest light in the room, saw Gil’s levity as part and parcel of the interview process. The more Campbell talked on about golf, the golfers, Johnny Miller, his Scottish ancestry, and his very own Glen Campbell Los Angeles Open Golf Tournament, the more difficult it became for Gil to maintain his composure. The interview, in its entirety, is in the finished film, and it is hilarious indeed. I spotted CBS commentator Jack Whitaker approaching the 18th Green and approached him to participate, which he graciously did. Gil interviewed him and his lines became a mainstay of the film. Whitaker mentioned to me that Gary Player was the best interview on the tour. He was outspoken, and answered questions without regard for political correctness. 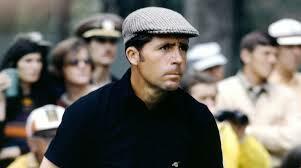 CBS commentator Jack Whitaker tipped me off to the fact that Gary Player was the best interview on the tour. Mike, who was the only member of this conspiracy who actually knew anything about golf, interviewed Graham Marsh and a few others, while I kept an eye out for Gary Player, who I finally located in the lobby of Troon’s famous Marine Hotel. Player, like most of his fellow golfers, was gracious and polite, and we made an appointment for an interview later that afternoon. I did the Player interview, and he was everything Whitaker said he would be, and more. Player delivered the most memorable lines in the finished film, and did not hesitate to sign a release, an issue that plagued us with some of the other golfers. Gary Player was the best interview on the tour. With much better than expected material in the can, we returned to London, where we had the negative developed by Color Film Services LTD, who struck the most beautiful work print I had ever seen. Bill, as usual had done an outstanding job with his camera. After a week in cold and rainy Troon, Bill, Viki and I gladly hopped a plane for the coast of Spain, to soak up some sun, do a little acid, and have what turned out to be a memorable time – worth its own story at some later date. Bill and Gil interviewing Tom Weiskopf. Back in New York, Bill and I spent eight weeks editing the film. We had worked on projects before and worked amazingly well together – seldom disagreeing on even the slightest editorial issue. It became obvious that we had something special on our hands. I came up with the obvious tile FOUR DAYS AT TROON. I had developed many contacts at some of the largest advertising agencies, so it became my job to find a buyer. Through various trade directories, I was able to find out which advertising agencies represented British products with American markets, which seemed like our best bet. The Ted Bates Agency represented Schweppes, and Wilkinson Sword razor blades, so I called. Jack Nickaus’s people generously granted us his release, even though we had forgotten to ask for it. I was stunned at how positively I was received, having in my possession thirty minutes of fully edited television programming. I made the presentation to the Creative Group on Schweppes, and it could not have gone any better. The Creative Director said, “We’ll take the whole thing, give full sponsorship, provided you can get CBS to run it, but I can’t see them not loving this.” He gave me the name of the head of CBS Sports, and mentioned that this film would make a great teaser, the night before day one of CBS’s coverage of The Masters. 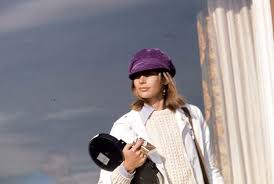 Viki Markle holding one of Bill’s film magazines. Was there ever anyone lovelier? I reported back to Gil and Bill, and the three of us were both stunned and delighted by our situation. It was decided that Gil and I would pitch CBS together. It’s amazing the difference between selling an idea, and selling a finished product. CBS loved the film. They liked the Bates idea about running Four Days At Troon as a teaser before the Masters. We had full sponsorship, the Network loved our film, and these desperados with questionably obtained press credentials were happy campers indeed. Then the roof fell in. We had been careless about getting releases. A release is a document allowing a film maker or a photographer to sell an image of a participant in a photograph or an on-camera interview for commercial purposes. Without a signed release, the buyer, in this case CBS, would fear litigation and refuse to purchase the film for broadcast purposes. We were missing two releases, and they were whoppers – Jack Nicklaus and Arnold Palmer. While Nicklaus was not interviewed, Bill shot him on the practice tee joking with other golfers, and he delivered some memorable lines. Palmer gave us an interview. We would need both. CBS made that clear. Bill Markle shooting the Glen Campbell interview. 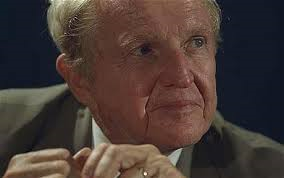 I called Nicklaus’s organization, Golden Bear Enterprises, and explained our situation. His people were cordial and agreed to attend a screening which we arranged at the Movielab screening room. Their only concern was that Jack Nicklaus was presented in a positive way. They were delighted with the film and agreed to have Jack sign a release. One down – one to go. The Palmer release would be more difficult. 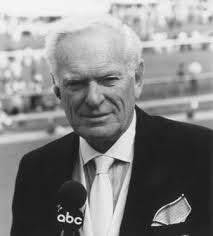 Arnold Palmer was represented by Mark McCormack, who had invented the occupation now known as the Sports Agent. He had started out with Arnold Palmer as his only client, and quickly made Palmer a rich man, while creating a sports empire that would become known as International Management Group, the first mega sports agency. McCormack, unknown to us, also owned Trans World International, the colossal production Company that owned the exclusive film rights to the British Open, where we had, through sleight of hand, obtained access to make our film, which CBS would not buy without Palmer’s legal participation. There wasn’t a chance in hell that McCormack would allow Palmer to sign a release for a film that would be in direct competition with his own exclusive arrangement between International Management Group, and The Royal and Ancient Golf Club of Scotland. We were screwed – we just didn’t know it. At this point I should mention the film known as Four Days At Troon, while editorially finished, remained in what is known as interlock. The picture was the work print that had been edited by Bill and I, and the sound track, while mixed, existed as a separate strand. This meant that the film could be viewed only on an editing machine, or in an interlock screening room. Mark McCormack’s offices were in Cleveland, and there was no interlock screening facility in the city by the lake. The alternative was to rent a portable interlock projector in New York and lug it to Cleveland. This machine is a large and cumbersome device, and ‘portable’ is a stretch in describing it. We had Ceco in New York ship the enormous projector to Long View Farm, where we could watch the film projected, and rehearse the machine’s workings. Early the next morning, Gil and I somehow squeezed this monstrosity into his Jaguar XKE, and began the journey to Logan Airport in Boston, to catch a flight to Cleveland in order to pitch our project to a man who had absolutely no intention of granting our request. It was an exhausting process, loading and unloading this machine, first at Logan and then at Cleveland Airport. Then the cab ride to One Erie View Plaza in downtown Cleveland, the headquarters of International Management Group. 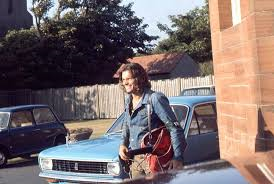 Gil lugging his sound equipment next to the Marine Hotel. I assumed that the philosopher was philosophizing, so I remained silent. A few moments later the door opened and in strutted the man himself, Mark McCormack, all six foot five inches of him. My heart sank. When we finished setting up the unruly machine, IMG’s key personnel began taking seats around the table. No one really greeted us, they just nodded and seemed restless. I announced that we were ready to begin, and someone at the far end of the table made a call. A few moments late the door opened and in strutted the man himself, Mark McCormack, all six foot five inches of him. My heart sank. Gil and I began our rehearsed pitch on the history of the project and McCormack cut us off immediately. We turned on the cumbersome machinery and the film began. I marveled at the extraordinary quality of the work print, made for us by that London lab. To say that the audience was unreceptive would be an understatement. Phone calls were made and received by people all around the table, who seemed totally uninterested by what was being screened. We had been sand bagged – bushwhacked – set up for a fall by a roomful of mid-western lawyers hell bent on humiliating the wise guys from the big city who had come on their hands and knees, begging the almighty sports mogul for his forgiveness and approval. Twenty minutes into the film, McCormack stood up and in a loud voice simply said “NO”, and walked out the door, followed in twos and threes by his cronies, leaving Gil and I alone while the film was still running. We were left with a lackey who was responsible to see the offending infidels to the street. McCormack stood up and in a loud voice simply said “NO”, and walked out the door. This entry was posted on March 22, 2015 by shauncostello. It was filed under Fiction and non-fiction from Shaun Costello and was tagged with 1973, ABC Sports, ALSG, American Leadership Study Groups, Arnold Palmer, Bill Markle, CBSports, FOUR DAYS AT TROON, Gary Player, Gil Markle, Golf, Golf Films, IMG, International Management Group, Jack Nicklau, Jack Whitaker, Jim McKay, Johnny Miller, Mark McCormack, Mike Forhan, Professional Golf, Rare Sports Films, Scotland, Shaun Costello, Sports Agents, Tall Guys, The British Open Golf Tournament, The Royal and Ancient Golf Club of Scotland, Tournament golf, Trans World International, Troon, Viki Markle. Great story. Sadly, the industry is chock full of dickheads like McCormick – tall and short! I didn’t know you were pals with Gil Markle. 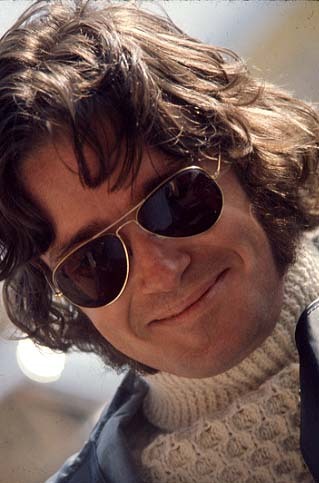 Have you ever been to Longview Farm the recording/rehearsing facility he built in Massachusetts? Many times Albert. I met Gil in 1973, the year he bought Longview.